" Kerry-Edwards will support the third-party candidates in asking the Federal Court in the Ohio recount lawsuit to order the preservation of the evidence obtained during the recount and to expedite discovery of the facts... 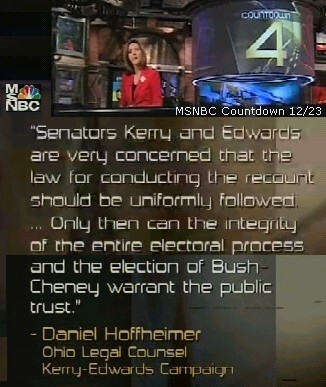 Senators Kerry and Edwards are very concerned that the law for conducting the recount should be uniformly followed. They want to be sure that all circumstances involved in the Ohio election, including the recount, should be put before the Court and disclosed to the American people. 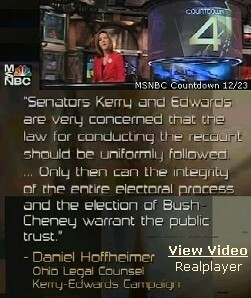 Only then, can the integrity of the entire electoral process and the election of Bush-Cheney warrant the public trust." On 23 December, 2004 Kerry's lawyer confirmed to MSNBC's 'Countdown' that John Kerry will be seeking (likely on Monday 27 Dec.) to expedite court proceedings and secure evidence in an ongoing recount suit by the Green and Libertarian parties. That might sound like just another "count every vote" exercise by the Kerry campaign, were it not for two important details. Kerry's court filing will conjoin him to existing allegations that Triad GSI, a Republican-linked supplier of voting machines to around half of Ohio counties --"orchestrated" a covert campaign to thwart a legitimate recount in Ohio. If the allegation proves well founded, it could invalidate the Ohio recount and eventually even hand the presidency to John Kerry. It's a signal move, likely driven by emerging evidence of suspicious activity by representatives of Triad GSI during the recount in Ohio. Evidence which has led a senior Democrat, ranking House Judiciary Cmtee. member, John Conyers Jr. to accuse Brett A. Rapp, the boss of Triad GSI of orchestrating a criminal conspiracy to pervert the outcome of the Ohio recount. The allegations first surfaced before an extraordinary Ohio hearing convened by Conyers on behalf of Democratic Minority members of the House Judiciary Committee. An affidavit filed by Sherole Eaton, Hocking County deputy director of elections, stated that a Triad representative had told her "how to post a 'cheat sheet' on the wall so the ...count would come out perfect and we wouldn't have to do a full hand recount of the county." For Kerry, a fraudulent recount in Ohio could be an open door into to the Oval Office. Already, John Conyers is confident that a few U.S. Senators will join House members on January 6 to question the November 2 election. On Thursday, the Chicago Tribune reported that in a conference call with journalists Jesse Jackson said that Kerry had conceded the presidential election "much too soon. Before all the facts were in." And to land a sticky mess of election fraud and judicial bias before the US Supreme Court and/or legislators convening to roll-call the electoral college votes on Jan. 6th, 2005. In an Ohio voters legal suit, the chief justice of the Supreme Court of Ohio has denied having personal knowledge of a plot to steal votes and has refused an emergency motion to recuse himself from the case. Enclosed please find a copy of a letter personally signed by John Kerry appointing me as his legal counsel, with full authority to act for him and John Edwards, including appointing witnesses to attend the recount. On Sunday, John Kerry urged Jesse Jackson to take a more active role in investigating vote irregularities like: 92,000 over and undervote ballots; provisional ballots; and independent analysis of the op-scan voting machines.